First of all, being a vegan means eating diet consisting exclusively of fruits, vegetables, nuts, grains and seeds, or more simply, not eating anything containing meat or dairy. My decision to become vegan was a bit tougher because I really liked cheese and eggs. They were my primary source of protein along with why powder, but the more I researched dairy, the more I realized that even though I had cut out meat from my diet, I was still consuming plenty of antibiotics, steroids, pesticides, chemicals and other toxins that farm animals are fed to produce dairy products. Again, I had heard plenty of conflicting information. That dairy is essential (practically a religion in grade school), that dairy is safe, that there are no significant amounts of toxins in dairy. Meanwhile, I read that animal dairy changes a baby’s stomach when they switch from breast milk and I did consider it weird that we are the only creatures on the planet that consumes milk after infancy and the only creature that consumes the milk of another creature. A ton of conflicting evidence either way, but since I was already a vegetarian and had been since January 2005 (Why I Became a Vegetarian), becoming a vegan seemed like a natural next step and curiosity led me to cut out dairy. I leaned out, dropping about 5 lbs without any other changes to my diet. Over the last several years of being vegetarian and then vegan, typical meals have looked a lot like what other people eat, except without meat. So a plate of veggies, salads, rice, breads, pasta, pizza with no cheese. Nuts, fruits, granola bars, cut veggies for snacks. The fact that my wife, Chay, is an exceptional cook makes being a vegan so easy for me is that my. When I first became a vegetarian, my wife and kids were still eating meat. Chay would cook a normal meal and substitute the meat on my plate with another vegetable. Then slowly she started to eat more vegetarian and learned vegetarian cooking and started making meals even better. By the time I had become vegan, Chay was studying vegan cooking and learning how to make meatless meals without dairy. This was a big plus, because taking cheese out of meals means a lot less sodium so sometimes food can be a bit bland. Since then Chay has found some amazing vegan cook books and recently committed to doing all the recipes in two great cookbooks over the next 250 days. She is blogging about each and every recipe she makes over at pinkvegan.wordpress.com. The food is exceptional and most people who eat it would be so distracted by the taste, they probably wouldn’t notice that they weren’t eating meat. I eat like a king every night. Very lucky. 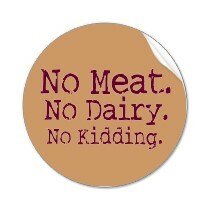 Most people can’t imagine cuttig meat AND/or dairy out of their diet. Now after 5 years, I can’t imagine eating any.